Happy Pride! 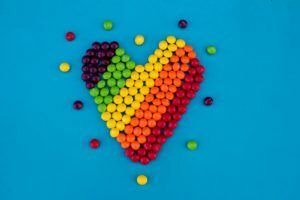 As a member of the LGBT community, it was especially fun for me to put together this week’s list of pie charts, blog posts, and other LGBT-themed links from my favourite corners of the web. Things You Should Never Have to Do. All of the sections in this pie chart were beautifully true, but I liked the one about never apologizing for your sexuality the most of them all. How the 18th-Century Gay Bar Survived and Thrived in a Deadly Environment. Wow, I never would have guessed that gay bars existed in the 1700s. Love and Rockets. What a beautiful sentiment. Do Algorithms Reveal Sexual Orientation or Just Expose Our Stereotypes? This was a long read, but it was worth it. Pride Around the World via KatyGilroyBlog. I loved this description of Pride Parades around the world. Warsaw’s Pride Parade sounds particularly fun. What It Means to Be Queer via quirkandfolly‬. This was such a detailed explanation of why this author chose to label herself as queer. The Story Behind Gay Bob, the World’s First Out-and-Proud Doll. Have you ever heard of this doll before? I hadn’t. Jeremiah, Opera Singer, Vancouver via TheGayMenProject. Honestly, all of the interviews on this site are interesting, but Jeremiah’s is a good place to start. I Chose to Be Gay Just Last Week. Yes, this title is tongue-in-cheek. I included this link especially for the heterosexual followers of this site. If you’d like a small taste of what it’s like to be part of the LGBT community, this post is a hilarious and accurate representation of some of the bizarre things people say to us sometimes. Cornwall Gay Pride via ellen_hawley. This blog post compares what modern-day Pride parades are like to how they were decades ago. I only wish this blogger had turned this into a series. It was so good. No, this post isn’t a reference to any of the old, classic songs about walking in the rain. 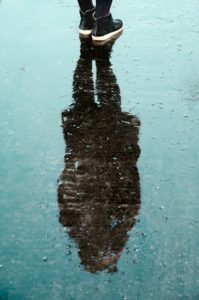 I actually hadn’t heard of Johnnie Ray or The Walker Brothers before I googled the title of my post to see what others were saying about the idea of taking a walk on a rainy day. This past weekend saw Toronto celebrating the end of Pride month with a street festival and series of parades for the LGBT+ community. The weather at the end of June can be unpredictable here. Usually, it’s hot and sunny during Pride Weekend, but every so often it’s rainy and cool for the festivities. This was one of those years when some people wore light jackets to stay warm and I’d wager that nobody ended up with a sunburn. Streets that are normally packed with so many people you can barely step a foot in any direction while Pride events are going on were actually half-empty this past weekend. I could walk up and down the street without accidentally being jostled into anyone, and this was even more true once it began raining harder than it had been earlier in the day. As I wandered around looking at the various booths, I realized just how much I like walking in the rain for a few different reasons. 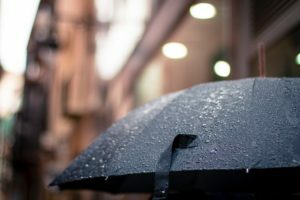 Cars, bicyclists, and pedestrians generally all slow down when it rains. While Toronto’s streets are looked after pretty well in most cases, rain can make even the nicest street unexpectedly slippery if there’s been a motor oil spill or if it’s precipitating heavily. My city is normally such a busy, bustling place that I relish it when we all get the opportunity to move a little slower and notice things on a street that I might not have picked up on before. There is something satisfying about exercising your body and mind at the same time through walking and paying closer attention to your surroundings than the average person might on a warmer and drier day. For example, the sides of certain buildings in Toronto are decorated with massive murals or other works of art. Some of it was either high-quality graffiti or was specially designed to look like that style of art. Other paintings were probably officially commissioned by the city due to how long they’ve been around and how visible they are from the street. No matter how long I live here, I continue to be occasionally surprised by the pockets of art that can be found in the most unexpected places. It makes me smile to notice something new while out on a long walk. Rain seems to chase people away from the outdoors more than almost any other type of weather. I understand the desire to stay indoors during a violent thunderstorm, but I’m sometimes surprised by how even a light sprinkling of rain is enough to keep many folks from enjoying a park, Pride festival, or other outdoor activity. The streets are so much quieter when it’s raining. Areas that are generally quite busy on a clear day are much less crowded on a rainy one. I’ve noticed that the ordinary sounds of city life – from a door slamming to the distant sound of someone loudly listening to their favourite music without headphones – seem to be muted as well. There is something incredibly peaceful about walking around in such a quiet environment. I don’t normally notice the background sounds of city life unless something incredibly unexpected and loud happens, but it’s refreshing to see just how quiet an area can be when there are fewer people milling around and when sounds seem to carry for shorter distances. This might be the fiction writer in me peeking out here, but I’ve long thought that the world looks different from normal when it’s raining outside. The colour of a building often darkens when its wet. I’ve noticed this the most with structures made from wood, stone, or other natural materials. To make this even more interesting, I’m not the sort of person who typically pays a lot of attention to architecture or design. It’s only when a house or building has had it’s exterior changed in some way that I’ll be more apt to stop, pause, and pay attention to the way it was put together and how it looks different when it’s wet. Clouds change the way an area looks as well. For example, a thick enough patch of fog can appear to erase buildings entirely. There have been times when I’ve looked out the window and been unable to see what was on the other side of the street due to how foggy it was here in Ontario. If you follow me on Twitter, you’ve no doubt seen an occasional reference to this from me. It makes me smile every time it happens. There’s something a little magical about walking down the street and not being able to see the top of a skyscraper or tree. If the kind of magic that exists in Harry Potter or Lord of the Rings were to suddenly appear in our world, I’d like to think it’s first act would be to play around with what us humans can and cannot see when we’re outside exercising on an overcast day. Even if you stick to what is currently possible in this world, it’s still cool to notice all of the changes in an area when rain, clouds, fog, and other natural weather phenomena change what we can see, how far we can see, and even how quickly we move. How do you feel about walking in the rain?